The history of Brentwood began in the 1870s. Prior to that, the region was occupied by the Miwok and Yokut Indian tribes. In 1772, Spanish explorer Captain Pedro Fages and his group climbed the western slopes of Mount Diablo and became the first Europeans to see the Sacramento-San Joaquin River Delta. In 1821, when Mexico gained independence from Spain, California was under its control. Fourteen years later, Jose Noriega was given the land grant known as Rancho Los Meganos by the Governor of California. The territory included 13, 316 acres and reached from Brushy Peak above Byron to the San Joaquin River. “Meganos” means “sand dunes” in Spanish. Two years later (in 1837), Noriega sold the Rancho to Dr. John Marsh. Dr. Marsh was the first American to live in East Contra Costa County. Until that time, only the Indians had inhabited the region. Through cattle raising and his medical practice, Marsh acquired great wealth. After marrying, Marsh began construction on what is now known as the John Marsh Stone House. It was the finest mansion in central and northern California, but sadly before it was completed his wife died. Within a few years, Dr. Marsh was murdered and the Los Meganos Rancho was sold to the Brentwood Coal Mining Corporation. With the opening of the Brentwood Coal Mines and the proposed plans for a railroad in the area, the Rancho owners began laying out the new town. Although there have been other suggested explanations, the popular belief is that Brentwood was named for Marsh’s ancestral home in Essex County, England. The first building in the new town was a blacksmith shop owned by J. P. Carey which opened in 1874, followed in the next few years by a saloon, a merchandise store, a warehouse, and in 1878, the first post office opened. The San Pablo and Tulare Railroad constructed railroad tracks that added Brentwood as a stopping point in 1878 also. The years between 1880 and 1910 marked ongoing progress in the area. Brentwood’s rich soil and weather conditions demonstrated that all kinds of vegetables, fruit and nut trees, and other agricultural products could be produced in vast quantities. When Balfour, Guthrie and Company, a British investment concern, purchased the Marsh rancho in 1910, its investments in the town hastened its progress. Beginning in 1865 with the opening of its first school, in 1884 when the first Brentwood Hotel was built, in 1885 with the establishment of the first church and organization of the first community baseball team, the town grew. There were a little over 100 residents. Devastating fires in 1891, 1903 and again in 1915 destroyed many of the town’s businesses, but the owners were not deterred and rebuilt as soon as possible. In 1902, Liberty Union High School was established so that local East County students could further their education past the 8th grade. The first graduation at Liberty was held in 1905. By 1906, there were 111 students attending the local high school. At present Brentwood has seven elementary (grades K-5) schools, three middle (grades 6-8) schools and the Liberty Union High School District includes three high (grades 9-12) schools, two of which are located in Brentwood. Organizations such as the Brentwood Women’s Club, Masons, American Legion and others were founded in the early 20th century. The Bank of Brentwood (later to be absorbed by the Bank of America) was opened in 1913. The Brentwood Library opened a reading room and lending library in 1915. The Brentwood Courier was the first newspaper for the community when it began publishing in 1892. It was followed by the Brentwood News (later named Brentwood Enterprise) that began in 1897. The Brentwood News continued to be published for many years under Editors Sam Hill and Edgar Allen. It is now published by the Bay Area Newspaper Group. Balfour, Guthrie and Company played an important role in Brentwood’s development after it purchased the Los Meganos Rancho in 1910. They built the Brentwood Hotel in 1913 to replace the one destroyed by fire. This structure was a center piece of Brentwood for many, many years. They also planned and installed the first irrigation system, mapped out the town and subdivided farm land advancing agriculture from dry-land grain farming to irrigated alfalfa and dairies. 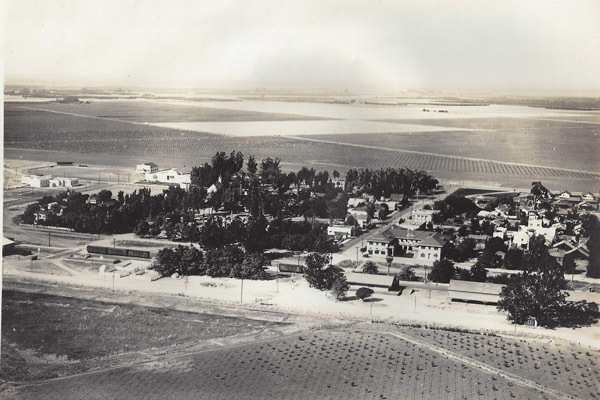 In 1922, Balfour, Guthrie planted orchards that added to Brentwood’s reputation as an agricultural mecca. This encouraged other agricultural concerns, including H. P. Garin Company, to seek land for farming in the area. By the end of the 1920s, Balfour, Guthrie had California’s largest dry-yard and packing shed, while H. P. Garin Company was shipping almost 800 railroad carloads of fruits and vegetables all over the United States. By a large margin, residents of Brentwood voted to establish a water district to serve the town with a domestic water supply in 1926 authorizing the issuance of a $20,000 bond to purchase equipment, install complete fire protection and develop new wells for the residents’ water needs. The fire bucket brigade gave way to the Brentwood Volunteer Fire Department after the installation of the wells in 1927. These dedicated volunteers answered the siren’s call for over 60+ years before being replaced by a paid fire department in the 1980s. Although several doctors had served the community from its founding, it did not have a hospital until Catherine Holden, M.D. opened Brentwood Hospital in 1929. Due in large part to the Great Depression, Dr. Holden was forced to close the hospital two years later. She left the area to practice elsewhere. She was followed by several private physicians who filled the medical needs of the town. By the mid-1940s, the population was growing and so were the needs for services. In 1947, a group of local business owners formed the Brentwood Improvement Association and started a campaign to get the necessary number of property owners representing 25% of the assessed valuation to sign a petition seeking the incorporation of Brentwood. Within two weeks, more than 170 property owners had endorsed the petition and it was presented to the Contra Costa Board of Supervisors. In an election held on January 15, 1948, the voters overwhelmingly approved incorporation. A City Council was elected with John Lane appointed as Mayor, a City Clerk was hired, the Police Department, Planning Department and City Court were established and the new city was off and running. After being housed in inadequate quarters for the first 15 years, Brentwood built a City Hall at the corner of Third and Oak Streets in 1963. It has since been replaced by a new City Hall/Community Center that opened in 2011. With a population of 1,729 residents at the time of incorporation, Brentwood has grown exponentially. In 2000, the city’s population was 23,302. By 2010, it was 51,481 and is still growing. The total area of the city at present is almost 15 square miles. Brentwood’s water tower that served the community for many years symbolizes the city’s transition from a rural farm community to a modern bedroom community. Located on Walnut Boulevard, it is the tallest structure in the city. It no longer is used for its original purpose, but now serves as a cell phone tower. Descendants of the pioneer families of Brentwood have welcomed all of the newcomers to the area. Graced by a breathtaking view of Mount Diablo, and the abundance of fresh fruits and vegetables, well-maintained streets, excellent schools, nearby shopping centers, cultural activities, Brentwood is a great place to live and work.